WASHINGTON — Ann E. Ewing, a journalist who specialized in writing about science and who is thought to be the first to report on so-called black holes, died July 24 at Washington Home & Community Hospices in Washington, of pneumonia after a stroke. She was 89. Ms. Ewing wrote from the late 1940s to the late 1960s for Science News, a publication of the Society for Science and the Public. Her specialties included astronomy, physics, and medicine. After leaving Science News, she became a freelance reporter who wrote for medical trade newspapers. Physicist John Wheeler has often been credited with coining the term “black hole’’ to describe a collapsed star whose mass is so great that not even light can escape its gravitational field. Wheeler reportedly first used the term at a 1967 conference. However, Ms. Ewing used the term as early as 1964 in her story “ ‘Black Holes’ in Space’’ after apparently hearing it at a meeting of the American Association for the Advancement of Science. She did not identify the source of the quote. Ann Elizabeth Ewing was a native of East Grand Rapids, Mich., and a 1941 physics and chemistry graduate of Ripon College in Ripon, Wis. She studied at the University of Chicago before joining the Navy in 1942, during World War II. She served overseas as a Navy journalist until 1946. 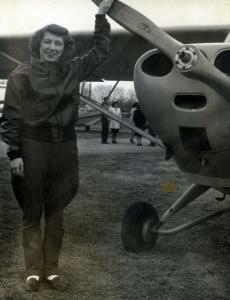 After the war, she received a pilot’s license and enjoyed flying small planes as a hobby. In 1972, Ms. Ewing became one of the first female journalists admitted to the National Press Club. Previously, she was a member of the Women’s National Press Club and contributed to two cookbooks by club members. She was active with civil rights and veterans groups. Her marriage to Justin F. McCarthy ended in divorce. She leaves two brothers.